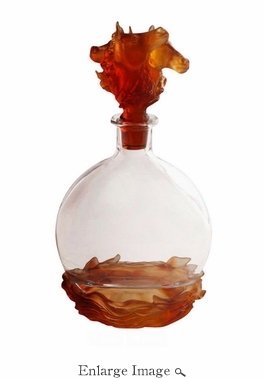 Horse Millesime Decanter. Size: H. 12 1/5" L. 6 7/10"
Size: 12.2 Inches High x 6.7 Inches Wide. Made By Hand In France. Kiln Fired For 10 Days. Every piece is unique, no two Daum crystals are exactly alike. For 130 years Daum has seduced the world's greatest collectors.....because art is the ultimate luxury. Few brands have worked with so many impressive artists, Salvador Dail, Arman, Cesar, Dan Dailey, Andrea Deluol, Claude and Francois-Xavier Lalanne, Paloma Piccaso, Roland Topor, Monolo Valdes and more. Daum has always called upon the greatest contemporary artists of every epoch. Over 350 fine artist have collaborated with Daum to create a legacy for the brand. For 130 years the Daum dynasty has found ways to contribute something original to the world of art. Every piece is unique, no two Daum crystals are exactly alike. Since 1878 Daum Crystal has been the ultimate in luxury.